Printmaking has helped shape culture in all parts of the world. Originally used as a form of communication, printmaking is a valued artistic medium with unique technical qualities. To make a print, the artist typically creates an image on a flat surface. The surface is then inked, and pressed onto paper to create an original print. By repeating the printing process, the artist is able to create multiple original works of art. The first prints are attributed to prehistoric times, when humans placed used their hands as stencils by placing them on cave walls and blowing pulverized pigment around them to create repeatable images. In approximately 500 BC, Sumerians carved images on cylinder seals that could be pressed into wet clay, thereby creating multiple imprints to indicate the ownership of goods. Chinese scholars created rubbings from carved texts around 200 AD, an early form of printing that could be done on paper and silk. Because it's affordable and suitable to printing, the invention of paper is a hugely important moment in the history of printmaking. As papermaking techniques spread from China to the rest of Asia, the Middle East, and Europe, printmaking became increasingly widespread and technologically sophisticated. Printmaking initially flourished as a form of communication, for it enabled artists to disseminate artowrk to large numbers of people. Starting in the eighth century, Japanese artists used printmaking to make multiples of Buddhist manuscripts. In fourteenth century Europe, woodcut prints became a popular way to distribute Christian images to the common people because acquiring a print was more affordable than acquiring an oil painting. In the fifteenth century, Gutenberg’s printed Bible ushered in a whole new era of literacy. From the Renaissance onward, individual artists became known for their spectacular use of printmaking. Albrecht Dürer dazzled fifteenth century audiences with the exquisite detail and craftsmanship of his paintings, woodblock prints, and engravings. Two centuries later, Rembrandt’s mastery of the intaglio medium enabled him to create an important group of over three hundred printmaking plates. About the same time, Japanese artists such as Katsushika Hokusai took woodblock printing to new heights. Later artists like Vincent Van Gogh would be profoundly affected by the printmaking practice of artists like Hokusai. Over time, the “toolbox” of printmaking techniques expanded to include etching, mezzotint, and eventually lithography, monoprint and screenprinting. As processes became more complex, artists began to create work in professional printshops under the guidance of a master printer. The late nineteenth century saw the rise of the artist-printmaker in Europe and the United States. Whether working independently or collaboratively with Master Printers, these artist-printmakers helped to firmly establish their medium within the artistic canon. Seminal figures within the nineteenth century include Turner, Whistler, Blake, Degas, Cassatt, and Goya. Artist-printmakers in the first half of the twentieth century include legends such as Chagall, Matisse, Munch, Picasso, Miro, Arp, Ernst, Dali, Kollwitz, Beckmann, Barlach, Kandinsky, Klee, Hopper, and more. In the same time period, artists all over the world carried printmaking to new heights. Japanese artists, for example, worked within the established tradition of ukiyo-e printmaking to create lumious woodblock prints depicting scenes from mythology and everyday life. In Mexico, artists such as José Posada flocked to printmaking for its graphic beauty and potential to effect social change. The famous Mexican Taller de Gráfica Popular (Workshop for Popular Graphics) provided access and inspiration for an entire generation of artists. Contemporary artists continue to use printmaking for its unique visual qualities. 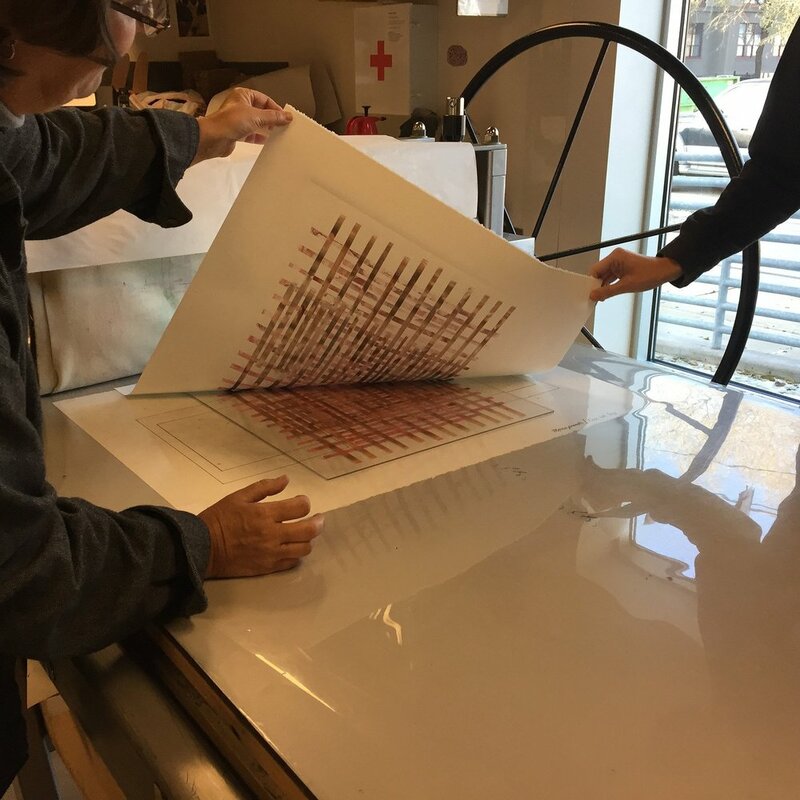 As today’s artist-printmakers work with time-honored hand processes, often in communal printmaking workshops that foster collaboration and innovation, they build on the rich traditions of their artistic forebears. Printmaking is a process that typically allows artists to make multiple original works of art. In most cases, the artist creates an image on a matrix made out of metal, stone, wood, or other materials. The matrix is then inked, and the inky image is transferred to a piece of paper, often with a press, to create an original print. Example of a monoprint using stencils. Painting ink onto a plexiglass plate. Drawing on a plexiglass plate. Preparing a plexiglass plate with inks, rollers and stencils. Using a template to line up the plate on the press. Placing the paper over the inked plates. The terms monoprint and monotype describe an image that can only be printed once in its original state, unlike other forms of printmaking. This technique is also the most painterly of the printmaking processes. Typically, the artist will use ink to paint an image onto a smooth surface such as plexiglass, a metal plate or cardboard coated with varnish. They will then lay a dampened piece of paper on top of the plate and run both through a press to create a unique, one of a kind print. The artist may also transfer the image by hand, using the back of a spoon to burnish the paper, instead of running it through a press. Planning an image to go onto a copper intaglio plate. Scratching a plate for drypoint. Applying rosin to plates for aquatint. Heating the applied rosin for aquatint. Painting ferric chloride as a spit-bite etching. Setting registration for an inked plate. Pulling the printed sheet off of the plate. An example of intaglio print progression. When making an intaglio (pronounced een/TAHL/yoh) print, the artist creates an image by using a variety of tools and/or acid to carve depressions in a metal plate (typically zinc, copper or brass). The artist inks the incised lines and recessed textures of the plate, and wipes the raised surfaces clean. 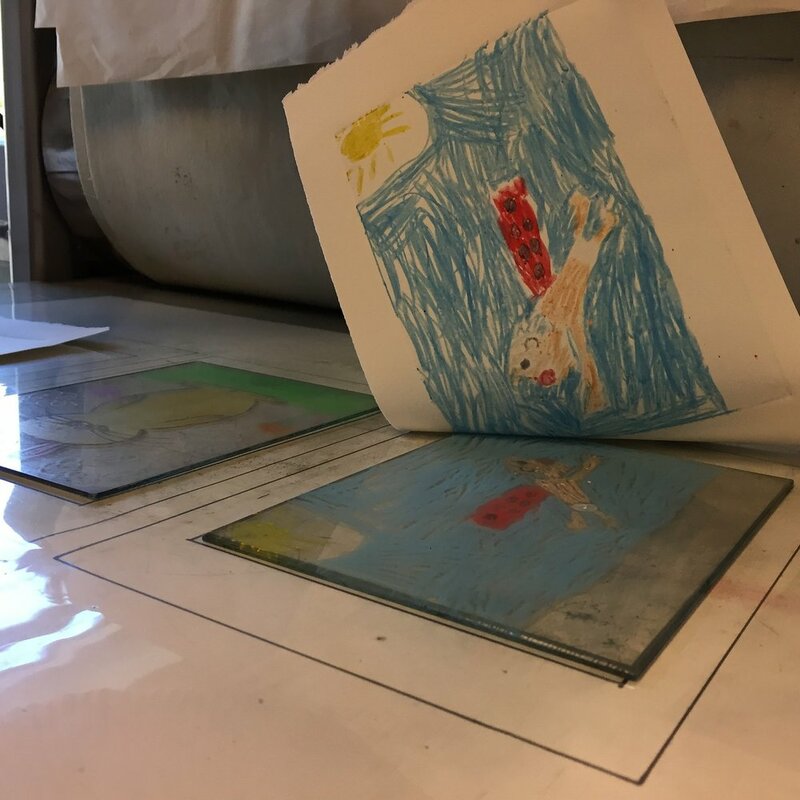 S/he then places a dampened piece of paper on top of the plate and runs it through an etching press, which uses extreme pressure to force the paper into the inked crevices. The dampness of the paper also helps soak up the ink. Intaglio printing can achieve effects ranging from crisp, clear lines to large areas of deep, velvety blacks. 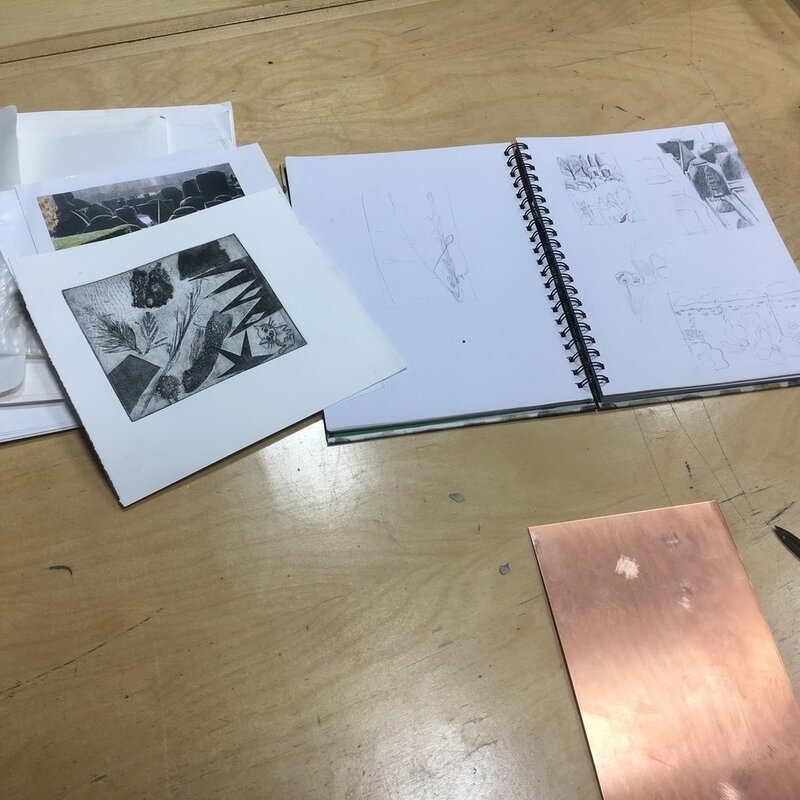 Engraving, drypoint, aquatint, and etching are the four primary intaglio techniques. This process is characterized by sharp, crisp lines that are created when the artist uses a steel tool, called a burin, to carve into a copper or brass plate. The deeper the cut, the thicker the line. Tonal areas are created by engraving cross-hatched or parallel lines. The image that results is clear and precise. In this process, the artist scratches a drawing onto a metal plate with a sharp needle. Metal burrs that result from the scratching trap and hold the ink after the plate is wiped clean. This creates a soft, heavy line that is unique to this type of intaglio. In this process the artist first dusts the metal plate with varying densities of an acid-resistant powder called rosin that adheres to the plate when heated. 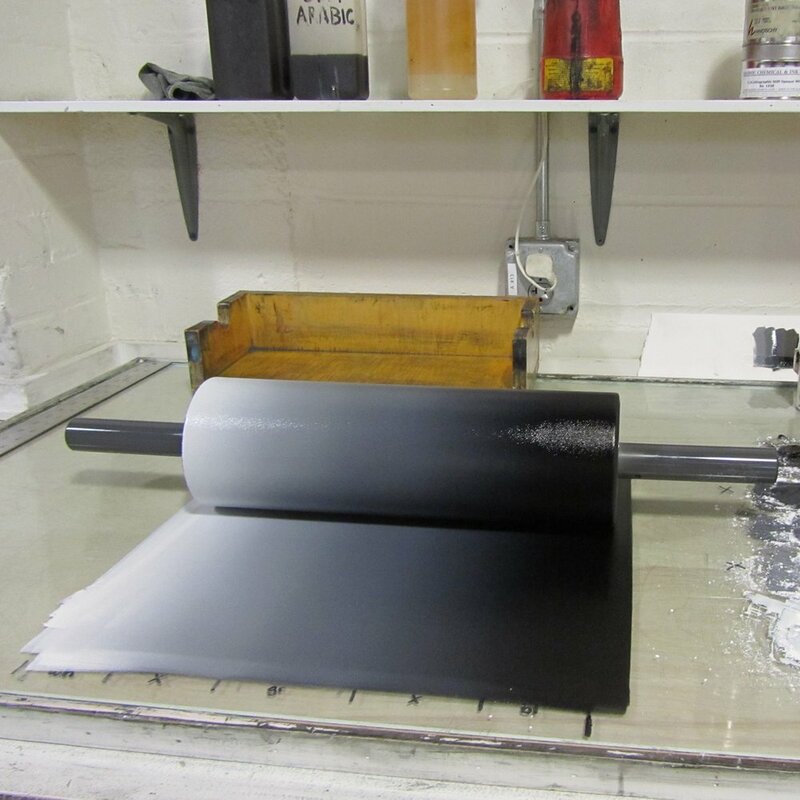 As the artist places the plate in an acid bath, the acid “bites” around each of the dusted particles – this technique creates various tones from light to dark when the plate is inked and printed. In this process, a copper, zinc, or brass plate is covered with an acid-resistant ground made of asphaltum, beeswax, rosin and solvent. After the artist scratches an image into the ground with an etching needle or other sharp object, s/he submerges the plate in an acid bath. The acid “bites” into the areas where the ground has been scratched away creating clearly defined lines. The longer the plate is submerged in the acid, the deeper the lines will become; this results in heavier lines or darker prints. Photographic images can also be transferred and etched into a metal plate. 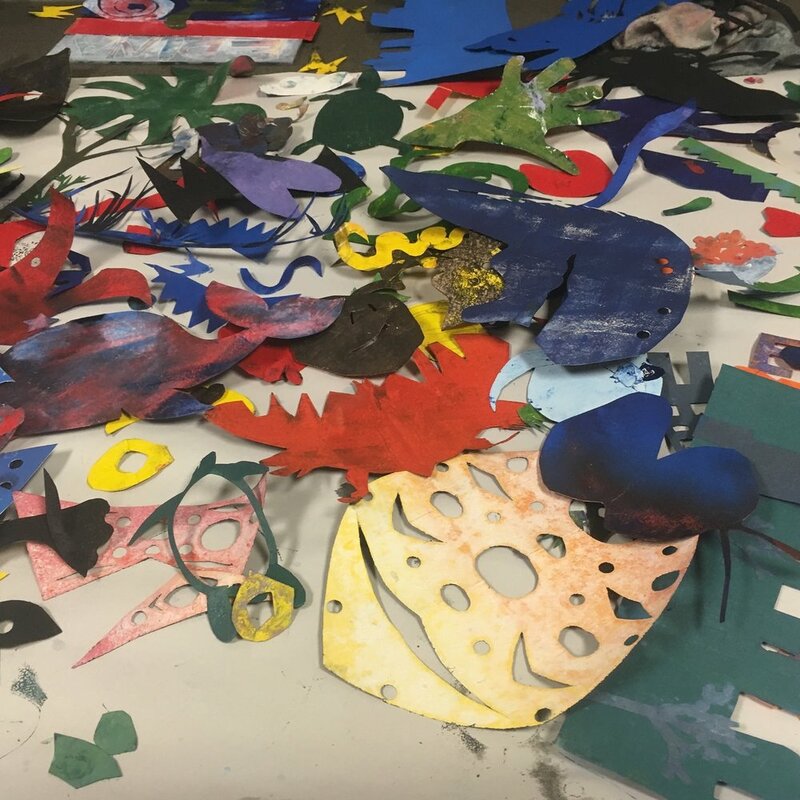 The collograph plate is made up of various objects that are glued onto cardboard and then varnished. The plate is then inked and run through a press like any other intaglio plate. This process is known for the rich, velvety blacks that are created when the artist systematically presses a curved, serrated “rocker” back and forth over the surface of a copper plate. The rocking creates thousands of tiny indentations with raised burrs. After the entire surface is roughened, the artist can create highlights by using scrapers or burnishers to smooth out areas of the plate. This produces soft tones in the image ranging from dark gray to white. Example of a reductive relief print. Carving a relief wood block. Rolling ink onto relief block. Printing a relief block by hand. Keiji Shinohara showing process examples for a ukiyo-e relief print. Tools for carving the ukiyo-e block. Carved block with ukiyo-e inks. Placing the paper on the inked block. Using a baren to print. 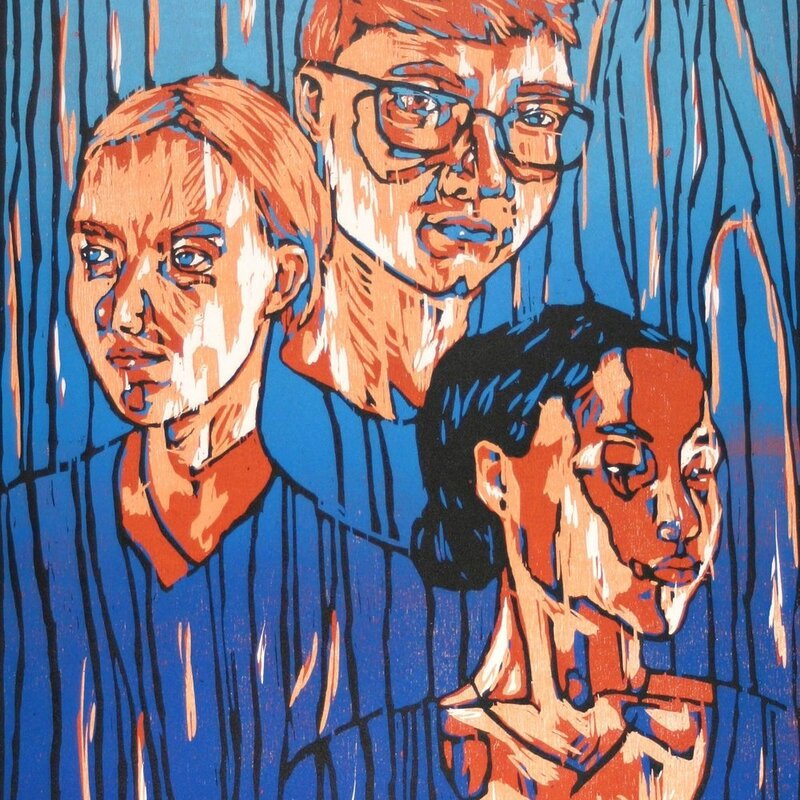 In a relief print, the image is printed from the raised portion of a surface area after the artist carves away areas s/he wants to appear white. It is the oldest form of printmaking, and these prints are often characterized by bold dark and light contrasts. 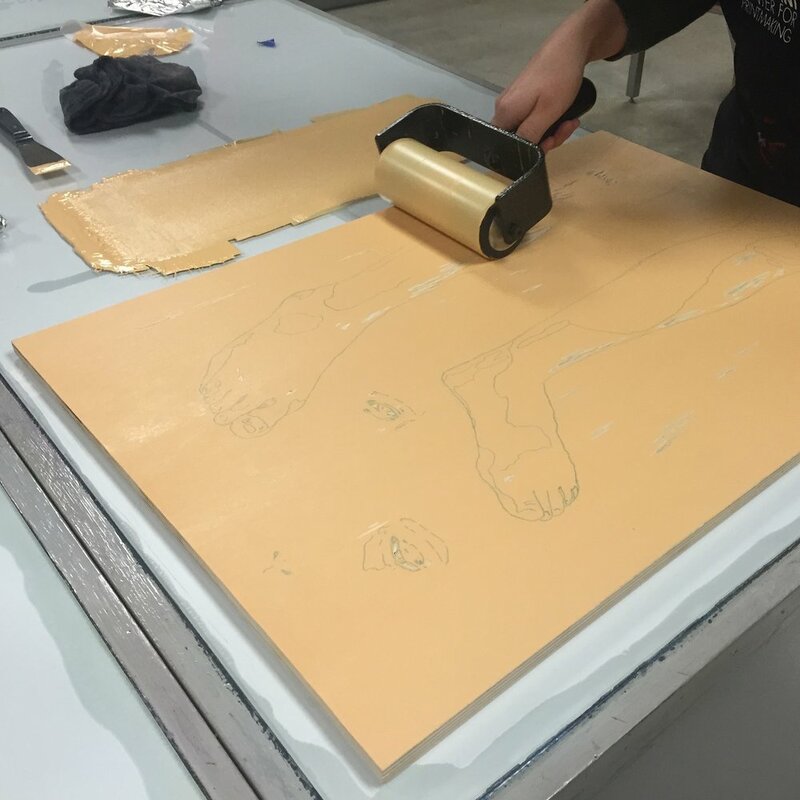 To make a relief print, the artist uses a sharp tool to gouge out areas from a material such as wood or linoleum. The areas that are removed will appear white in the final print, and the inked raised portions will create the image. The artist uses a roller to apply ink to the raised portions of the surface and places a sheet of paper on top of the inked surface. S/he transfers the image onto the paper by either rubbing the back of the paper (hand-burnishing) or by running the block and paper through a press. Woodcut, wood engraving, and linocut are the three primary relief techniques. In this process, the image is carved into wood blocks whose surfaces run parallel to the grain. Because the grain is resistant to cutting, detail is often difficult to achieve. However, with softer woods, the grain pattern itself is often visible and can be incorporated into the composition of the final print. In this process, the grain is not apparent in the print because the image is carved into the end-grain surface of a wood block. This allows for much finer detail than woodcuts can offer. Here, the artist carves into linoleum which is usually backed with wood for reinforcement. Since linoleum does not have a grain, this method can achieve lines that are curvy and moderately detailed . Example of a screen print. Cutting contact paper to use as a stencil. Applying contact paper to a screen as a stencil. Coating a screen with light-sensitive emulsion. Applying ink to the screen. Using a squeegee to push ink through a screen onto paper. Screen printing uses a stencil method to create images. First the artist must build a screen by tightly stretching and attaching a finely woven fabric, usually a monofilament polyester, to a sturdy wood or metal frame. Then, the artist uses a material such as glue, paper, shellac, film stencils, or photographic processes to block out areas on the screen; the areas left open will print. The artist lays the screen on top of a sheet of paper or other material and squeegees ink across the entire screen. The ink passes through the open areas of the stencil to create the image. The artist can then make more stencils and can build images in layers with different colors and designs. Drawing on a stone with a grease crayon. Preparing a ball-grained plate for etching. Rolling out a blend roll. Laying paper on an inked polyester plate. Printing from a polyester plate. Looking at an impression from a polyester plate. 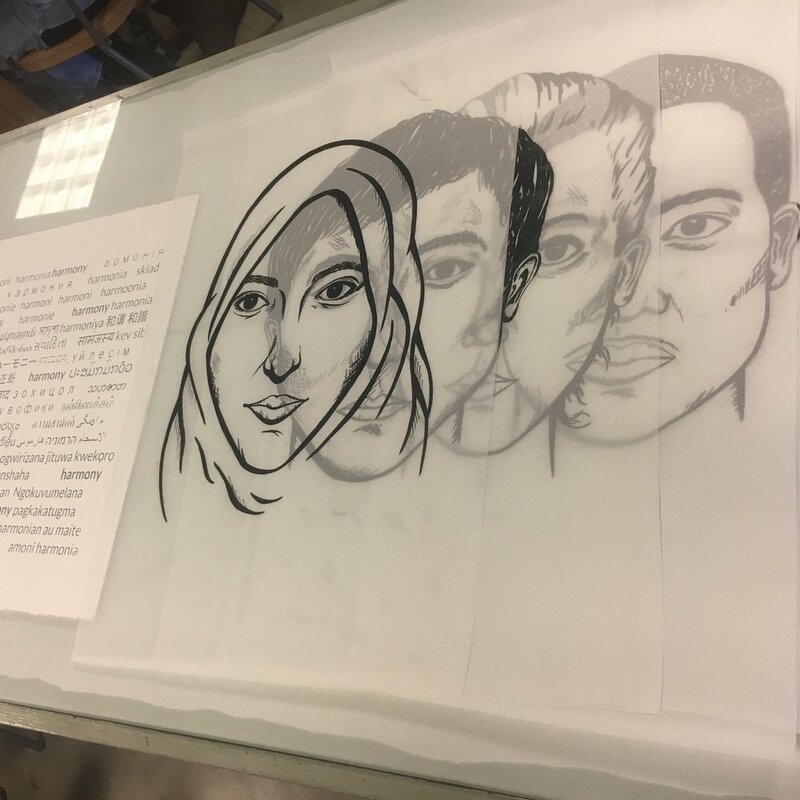 The lithographic process enables artists to create images with a wide tonal range, which often results in a look that is similar to charcoal drawing or painting. In lithography, the artist uses a variety of greasy crayons or tusche to draw or paint onto smooth, leveled limestone or a fine-grained metal plate (like aluminum or zinc). The image is then chemically treated with a mixture of dilute nitric acid and gum arabic. This chemical process serves to fix the grease onto the stone and to prevent the other areas from receiving ink. The stone is then sponged with a thin layer of water. Only then is the stone inked. The water prevents the oil-based ink from adhering to the blank areas while the greasy areas readily accept it. The image is transferred from stone or plate to paper by the pressure of the lithographic press.